On January 14, 1993 a Colombian volcano, Galeras, erupted. Nothing major, just a little 'hiccup'. It would have passed completely unnoticed if not for one tragic detail: a group of scientists was gathering data on the top of the volcano at that very moment. Six of them (plus three tourists) died. Others escaped with their life but suffered grave injuries. Surviving Galeras, written by an eyewitness, tells the story in detail. The book has caused some controversy. It has been published alongside another title, No Apparent Danger by Victoria Bruce, which tells exactly the same story but from a different perspective. 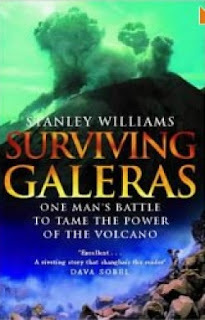 In short - some say that Stanley Williams was responsible for the Galeras tragedy. Williams himself, obviously, claims otherwise. For the record - I was not aware of this 'book battle' at the time of reading Surviving Galeras. I found the book quite interesting - after all, what a story! - but not mind-blowing when it comes to pure writing skill. I noted how courteous Williams was when speaking of his colleagues involved in the accident. How he carefully quoted other survivors' versions of events. How - well, I guess the right word here is 'humble' - he was about the whole affair. Then I read reviews pointing to his 'huge ego' and thought: wtf? I don't know who, if anyone, is guilty of the Galeras tragedy. I do know that I did not detect this 'ego' in Surviving Galeras. I did detect a very good story, written in a competent, if a tad too politically correct, manner. I'm not a big fan of health and safety regulations. If you're worried about your health and safety, do not climb an active volcano, that's all there is to it. The volcanologists who died that day knew what a volcano can do and still decided to go through with the trip. Claiming otherwise does not do a great service to their memory. Well, think what you will. The book is good, either way. For propriety's sake I should probably add that the book was co-authored by Fen Montaigne. He didn't make it onto the cover of my edition, so he's not going into my post's title either.